Today biometric or electronic passports are an essential part of safe and efficient travel. This type of official documents acts like a fingerprint and allows more reliable verification of the holder’s identity. They are embedded with radio frequency identification microchips that hold information about the owner’s physical characteristics (for example, the distance between the eyes, nose, ears and mouth), as well as other personal data, such as their name, date of birth, birthplace and passport expiration date. 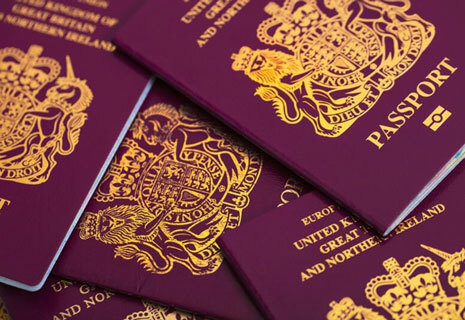 Having such a sophisticated passport at hand, you can secure yourself from identity theft and streamline airport queues. However, this document requires a specific biometric passport photo that meets all the requirements of official agencies. Keep reading and you’ll find out what makes this kind of photos different from other ID pictures and how to prepare it yourself. When renewing your passport, take into account the latest photo specifications and your application will be processed without any problems. Below we’ve listed key requirements to photo dimensions and quality so that you won’t have to browse through other websites. Your biometric photo for passport must be taken within the last month prior to applying. The photo must be 2x2 inches in size, with the head covering between 1 inch and 1 3/8 inches of the overall height (in case of US passport). The photo resolution must be no less than 300 dpi (better 600 dpi). 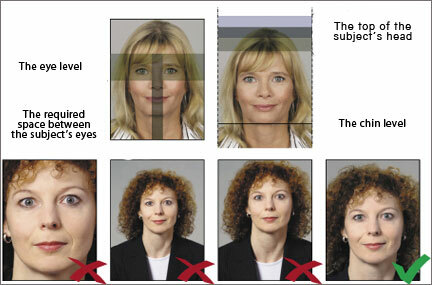 Your face must be in focus, have good contrast and accurately reflect your natural skin tone. The photo background must be one color, ideally white or light gray, with no patterns, shadows or any other odd objects. Your face must be evenly illuminated across all features, with no shadows. Red eyes, glare or reflections on glasses are not acceptable. You should look directly at the camera wearing a natural expression. Your mouth must be closed with no smile or other emotion present. Your eyes should be fully open and not covered by hair or head coverings, and both of your ears must be visible. No hat or head covering is allowed unless it is worn for religious or medical grounds and all facial features are still visible. Two identical photos should be printed on quality glossy or matte paper with no border. Need to prepare an official photo of your child? The same composition rules also apply to baby passport photos, with a couple of exceptions. Children under 6 years old do not need to be looking straight at the camera. However, no toys or other objects are allowed, and the child must be the only person visible in the photo. Toddlers and smaller kids can be supported by a hand, but the hand may not appear in the final photo. Under 1 year old, it is also permissible for the child’s eyes to be closed. All these requirements are not easy to comply with but it doesn’t mean your photo must be government-issued. 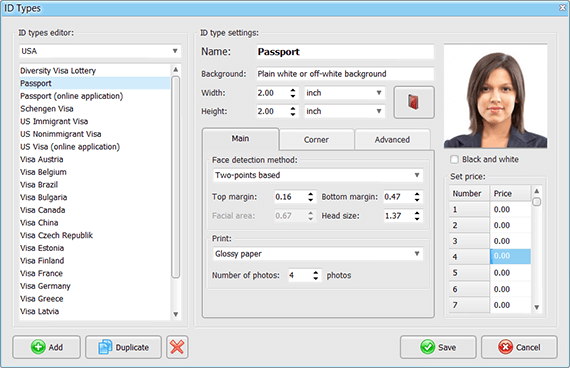 You can take an ID picture yourself and prepare it at home using a biometric passport photo maker. Want to give it a try? Let’s get things under way. 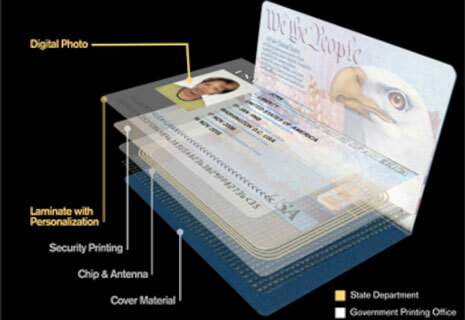 Today there’s a wide choice of programs and online services to generate ID pictures. We’d recommend you get started with Passport Photo Maker. 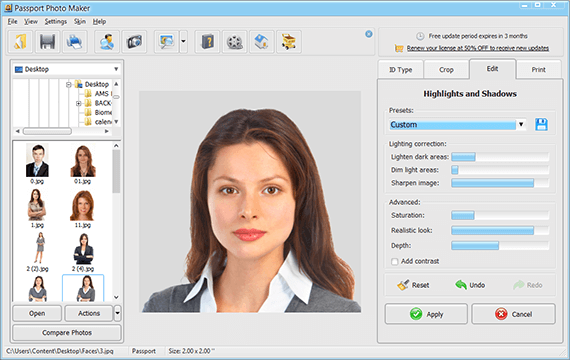 This biometric photo creator is convenient and offers professional tools that you won’t find in other software for home use. Below you’ll find a step-by-step guide on how to work with the program. Click the Open Photo icon to add the picture you’ve already taken to Passport Photo Maker. If you have several photos and can’t choose the best, click Compare Photos and simply drag up to six of them from your Windows Explorer to the working area. The program will present them side by side, and you’ll clearly see which one looks better. You can also take a photo of yourself using a default camera in your computer. Click File > Webcam Capture. In a new window, connect your camera to the program and take a shot you’ll then edit. 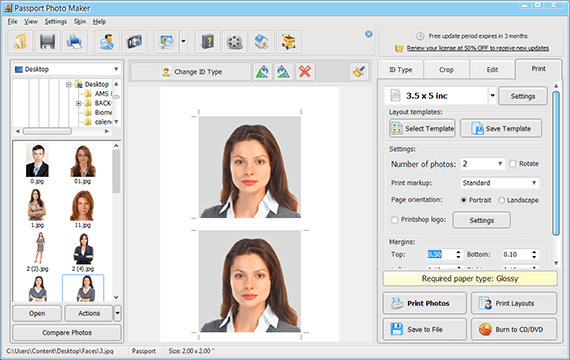 While on the ID Type tab, choose a suitable passport photo template. Click the Settings button and pick your country in the drop-down menu. Below you’ll find a list of typical documents. Choose the desired template and check out photo specifications to make sure it’s the biometric passport picture you need. The built-in database of photo requirements guarantees that your photo won’t be rejected and will provide proper authentication. Push the Next button or switch to the Crop tab. Thanks to smart face detection technology, the program will automatically mark the top of your head, eyes and chin with dotted lines. That way you don't have to worry about the right size of your head in the photo. If the face recognition module hasn't worked properly on a certain picture, you can always move the red and yellow lines to put the whole face into focus or change its proportion. Move to the Edit tab to adjust the tone of your photo, replace everyday clothes with more formal attire or digitally change background. The program lets you improve the color balance, change the highlights and shadows settings without exporting your picture to some other editor. 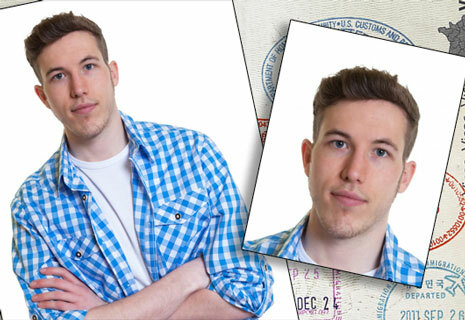 However, while working with your passport photo, try preserving it natural look. Otherwise, your application might be rejected for too many changes in post-production. When your passport photo is ready switch to the Print tab. Choose the size of your paper to fit two photos. Set the margins and add crop marks to leave enough space between the pictures and make it easier to cut them out once printed. Use easy monitor calibration for the best printing output. 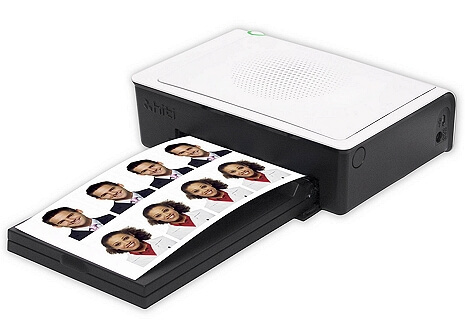 Once you’re totally satisfied with the result, click the Print icon and get your biometric passport photos. 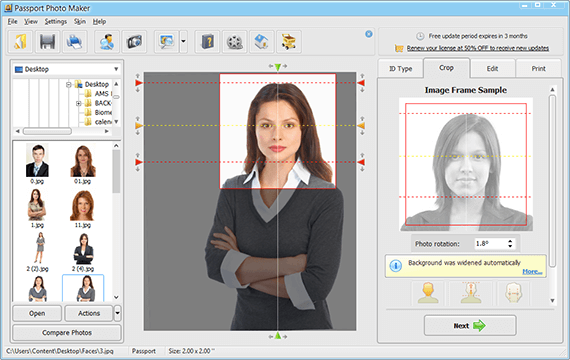 Passport Photo Maker isn’t just biometric passport photo software, it will help you prepare decent ID pictures for all kinds of documents - visa, driving licence, student’s card, Green Card, DV Lottery and many others. 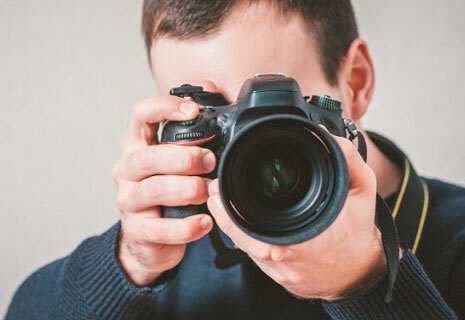 Of course, you can find a photo booth and have your picture taken by a professional photographer, or you can pay once for this ID image maker and make as many official photos as you need in the future!